Discounted legal services with local solicitors Thatcher + Hallam. 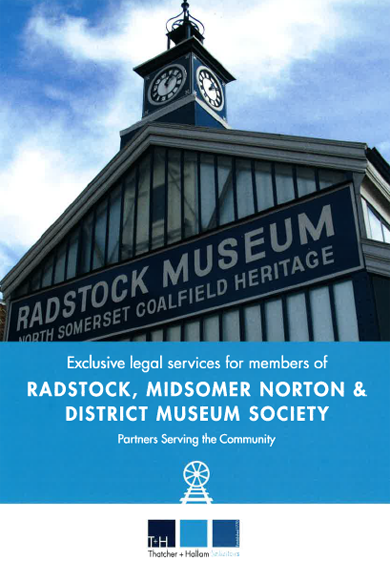 The Museum Society has arranged a ‘Members Only’ discount on some legal services with local solicitors Thatcher and Hallam. This offer includes a free 30 minute appointment and can also be used by Museum Society Members’ children who are over 18 years. Click the image to download a brochure. Please go to the Museum Society’s webpage for more details of how to become a Museum Society Member. Centurion Travel, based in Midsomer Norton and Welton, are offering a reduced rate of coach hire to any schools using their coach service for school trips to the museum. This offer has now been generously extended to general Group Visits to the museum. A huge thank you to Steve, Martin and the team at Centurion Travel for arranging this. In partnership with Somer Valley FM: January 2018. Two members of Radstock Museum team now produce and contribute to a one-hour weekly radio programme called ‘The Yesterday Programme’ on Somer Valley FM.